I received feedback from several users regarding the CLS problem which occurs with the Nikon D800. Well, it is not reproducible, therefore it sometimes occurs and sometimes it works, which is what I encountered again when I shot the title picture for this post. 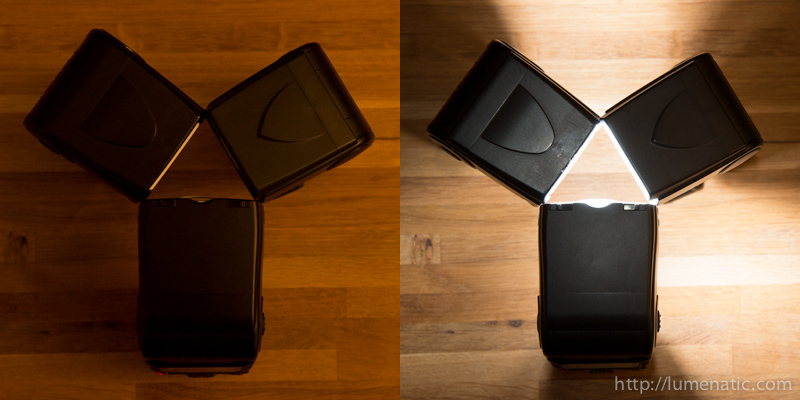 I wanted something quick and easy, put all three flashes on the table and triggered them with the D800. There you have it. No fire – fire. I compiled the feedback I got to get an overview on the issue. Nine people commented with information on their camera, flashes and whether it works or not. The result – it is totally mixed, only one thing is certain. Every D700 (yes, seven hundred) user reported that there are absolutely no problems. One guy even tested the same flashes with his D700 and the D800 and had no problems with the first and problems with the latter. The flashes used were SB-700s, SB-800s, SB-900s and a Metz 58 AF-1. Some D800 users said it’s working without a problem, others had the same problems I encountered. The bottom line is, that there is definitely something with the D800. It’s still unclear why some people have problems and other not. The firmware in the D800 is the very same for everyone. Perhaps only flashes with an older firmware tend to have problems with the D800, but before I do wild guesses I am ending this post by saying that I am very satisfied with the D800 and that I am confident that a firmware update will fix this.